A few weeks ago, Lee Ridley (a.k.a. 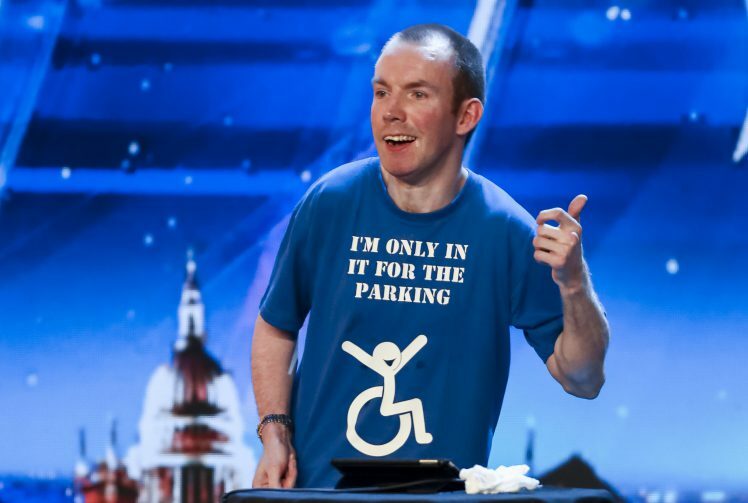 Lost Voice Guy) became the first comedian to win Britain’s Got Talent, now in its 12th year. As well as outshining his competitors along the way, and winning with a clear margin, Lee was a favourite with both the judges and the public. What also makes Lee’s win even more incredible is that fact that he is the first person with a disability to win the show. For a stand-up comedian, being able to connect with your audience is essential, and he did this with self-depreciating humour, fantastic delivery and some killer one-liners, all done through the use of Alternative and Augmentative Communication(AAC). AAC provides a means of communication for those whose speech is not sufficient to communicate functionally in all environment and with all partners. Lee uses a combination of two devices to support his communication – an iPad with apps, and a dedicated device called a Lightwriter. Lee has been on the comedy circuit since 2012, and has won prestigious prizes, including the BBC Radio New Comedy Awards in 2014. Below is an interview that Lee participated in, via email, with Karl O’Keeffe back in 2013, which gives some insights into his process and the unique challenges that using a synthesised voice can present. Check out Lee’s other work on his youtube channel (www.youtube.com/user/LostVoiceGuy) – be prepared to laugh your socks off! Karl: You are the first person ever to do stand up comedy who uses a communication device, so you had nobody to learn from. What are the most important techniques and tricks you have learned so far that you wish someone had told you when you were starting? Lee: I think one of the most important techniques that I have learnt is how to deal with timing. Obviously it’s pretty hard to know when to leave pauses for laughter and stuff, especially as I have to pre plan this. I can pause whenever I want but you have to be ready to pause when people laugh otherwise the start of the next bit gets lost or they don’t laugh as long. You sort of have to know when it’s coming so you’re ready for it. Obviously every audience is different so I’m never going to get it right every time. I think I’m getting better at anticipating when to pause though. Karl: I see from your videos that you use both a LightWriter and an iPad. Can you tell me which it better for stand up comedy? Lee: I use my iPad for my stand up and I use my Lightwriter for day to day conversations. I just find that my iPad is easier to understand slightly. It is also easier to find my material on the iPad and because it backs up to the cloud, it’s a bit more secure and means i can use any Apple device. It’s also a bit sexier than my Lightwriter. Karl: Do you always use the same voice? Why is the voice important in your performance? Lee: I use the same voice mostly yes. However I do use other voices in my act as well for comedy purposes. For example, I use a woman’s voice to do an impression of my mother. I think that my main voice is important to me because it has become ‘my’ voice. It’d be weird if I changed it now. Karl: What app do you use on the iPad for communication? Lee: I use Proloquo2go, which is a brilliant app. It is very complex but easy to use at the same time. It does everything that I need it to do really. Karl: What is your favourite app on the iPad? Lee: I tweet quite a lot so I tend to use Tweetbot all the time. I couldn’t get through long train journeys with the Spotify app either! Karl: Do you use any other Assistive Technology (computer access etc.)? Lee: No. I only use Proloquo2go on my iPad and iPhone and then my Lightwriter.